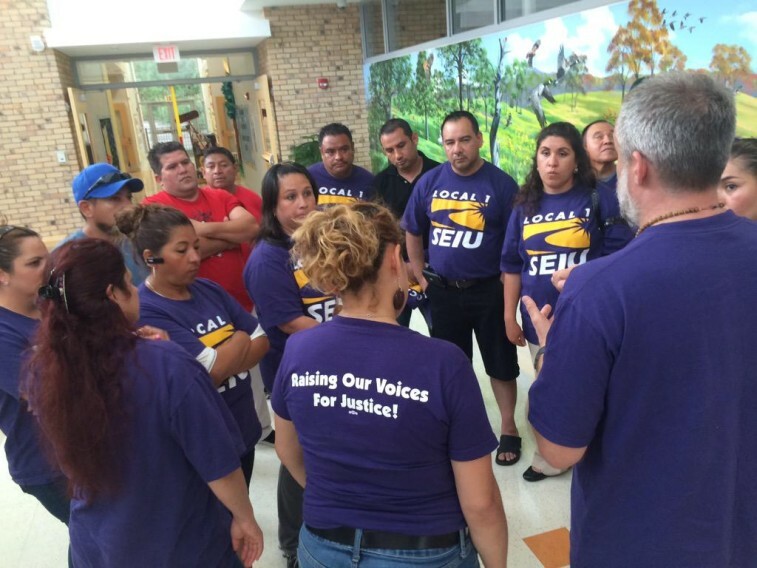 A majority of the school’s contracted janitors—organized by SEIU—are striking because, after the Barrington school district renewed a contract with their employer in June, their wages were cut from $9.77 an hour. Already without sick days and health insurance, the janitors are now faced with even lower poverty wages. As our publication, Making the Grade? Questions to Ask About School Services Privatization, discusses, school districts often don’t save money when they outsource support positions rather than keep them in-house. When contractors aim to maximize profit, students often face dirty classrooms, unreliable bus routes, and strained, underpaid workers. And we’ve found, across the public sector, that outsourcing services often sets off a downward spiral in which lower worker wages and benefits can hurt local economies and destabilize middle and working class communities. Making the Grade? provides questions that school service personnel, teachers, parents, and community stakeholders should ask when privatization of critical services is on the table. If education budgets continue to stretch thin, something has to give. When privatization is the answer, more often than not ‘what gives’ are conditions for students and workers, while private profit goes unchallenged.